Urticaria (Hives) are red, itchy, raised areas of the skin that appear in varying shapes and sizes. They range in size, from a few mm to several inches in diameter. Hives can be round, or they can form rings or large patches. They can occur anywhere on the body, such as the trunk, arms and legs. They are produced by histamine (the substance that plays a major role in many allergic reactions). Histamine dilates blood vessels and makes the vessel walls abnormally permeable. It also causes fluid to leak from the local blood vessels, leading to swelling in the skin. Combination of cold and heat, contact with excessive cold and heat, allergens in food, intestinal worms, suppressing the urge of vomiting, improper handling of Panchakarma , eating incompatible foods, insect bite, contact with herbs such as Bhilawa (Semecarpus Anacardium) or Kaunch (Mucuna Pruriens), arsenic usage in medicines, including certain painkillers, antibiotics, anti-hypertension drugs, codeine can cause urticaria. When a person comes in contact with cold air often, it causes aggravation of Kapha and Vata. It assimilates with aggravation of Pitta Dosha and spreads into the Rakta Dhatu (blood tissues). This leads to relocation in the skin, eventually causing Shitpitta or Urticaria. Urticaria can also be an allergy. Allergies are an inappropriate response – either an overreaction or an inappropriate reaction – to the environment. These appear due to imbalanced immunity or aggravated body energies that lead to the formation of toxins in the body. The line of Ayurvedic treatment consists of purification of the body of toxins with herbal preparations. Administration of digestive herbs restores the digestive fire and oils may be applied to nourish and tone the skin. Relaxation of the mind is also an important part of the treatment. 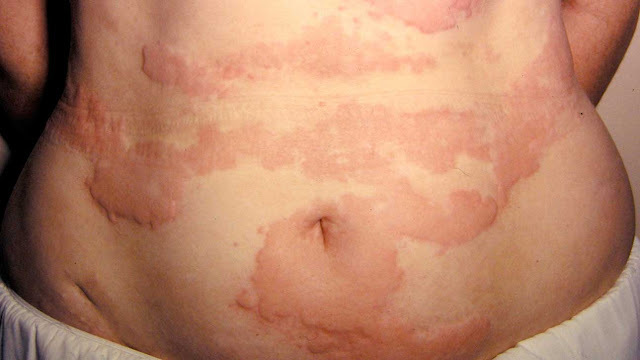 Panchakarma treatment therapies such as abhyanga (massage), svedana (fomentation), vaman (induced vomiting) and virechen (induced lose motion) are known to be effective in treating Urticaria. Avoid incompatible foods, sour foods, and heavy foods that are difficult to digest. Have freshly prepared, easily digestible foods. Eat cooked split gram (split legumes), bitter gourd vegetable, and pomegranate. Use honey rather than sugar. Use mustard oil for cooking. Fast for one day or have very light foods like porridge, boiled rice, vegetable soup, etc. Avoid suppressing the urge to vomit.